SECURE THE WALLS, REPAIR THE FOUNDATIONS! 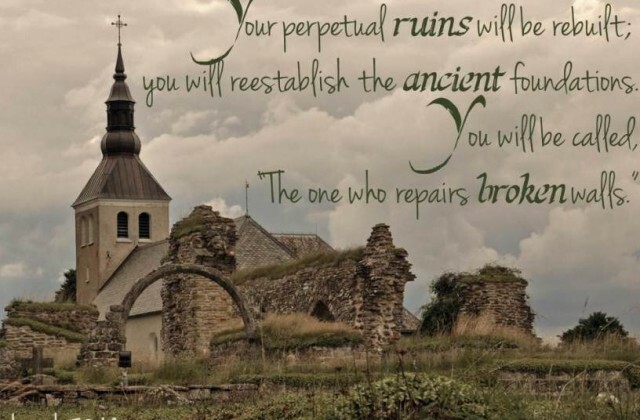 And your ancient ruins shall be rebuilt; you shall raise up the foundations of many generations; you shall be called the repairer of the breach, the restorer of streets to dwell in (ESV). In recent days, this word has been coming to pass in my own life and in the lives of many around me. This is not something I had been thinking about or even looking into, yet the Lord began to draw me through dreams and conversations to look into my past in order to examine my spiritual foundations, especially as a young child. Through a series of prophetic dreams and divine appointments, I was shown some open doors in my life that the enemy was coming through to create confusion, lack of focus, and physical oppression. As I began to share this with some friends, I was surprised to find that, they too, were being led on a similar journey into their past. It seems that there are some very small cracks in some of our foundations because of some generational issues gone unchecked. At first glance, they may seem insignificant. Yet, because of the coming pressure in the days ahead, the Lord wants us to fill in all these gaps and repair any breach in order to secure them firmly. Even as the kingdom of God is expanding in and through us, the enemy will continue to assault us and our foundations must be secure to withstand these attacks. For those who have been pursuing the Lord and preparing for great exploits, a target has been on your back. It’s precisely because of the call and anointing on your life that the enemy is trying to find any evidence of wrongdoing or misconduct in your family line so he can disqualify you and abort your destiny. However, because of the zeal of the Lord for us and His relentless pursuit to see His sons and daughters succeed, He is using dreams, visions, and unexpected circumstances and conversations to give us clues and insights into the enemy’s schemes. Our Heavenly Father wants us to know exactly where the cracks are and how to fix them so that our walls are secure. In my own life, I have been led to pray concerning the influence of Freemasonry in my generational line. Though I prayed through this issue several years ago and found tremendous breakthrough, it seemed to surface again in recent weeks. Surprisingly, I have had several other close friends tell me the same thing. The vows and oaths taken in this secret society has created a crack in our spiritual foundations and the Lord is encouraging us to pray to break these unholy alliances. For me personally, I have already felt a shift and breaking of oppression and confusion. The Lord even gave me words in knowledge in my dreams to indicate exactly where the cracks were and how to repair them! These legal loopholes the Adversary was using against me have now been dealt with. I have renewed energy and focus with increased grace and power. There may be other ways in which the Lord is drawing you to look at the walls of your spiritual foundation. This isn’t anything you will have to work at or strive for. Simply be alert and available. The Holy Spirit will reveal whatever is needed and show you the way through. The recent emphasis on understanding the courts of heaven has prepared the body of Christ to deal with these legal cases in the spirit realm. The Lord has given us everything we need to grow from glory to glory and be firmly established as His sons and daughters. If we want to see the cultural transformation that many of us are praying for, our walls must be secure, both individually and corporately. As intercessors, we need to pray from a place of spiritual and emotional health based on a secure foundation of faith and practice. As the corporate Church, we must address any cracks in our foundations so that we can stand strong in the midst of the storms that continue to come against the gospel of Christ and the advancement of His kingdom. Be alert to where the Lord is directing you concerning your foundations. He wants you to walk in the fullness of your inheritance because the Father’s House is being established in the land. Watch this short video below that I posted on Facebook this past weekend concerning this word. Below the video is also a link to more information on breaking free from the curses associated with Freemasonry. 10 Comments on SECURE THE WALLS, REPAIR THE FOUNDATIONS! This message was a blessing to me.one time while praying through Isa 61:4,i realized that covenants entered by My ancestors were fighting m yu ministry,spirits would follow Me around whispering to Me that I belong to them.its a battle am yet to win. “Sunburned”(part 1&2) von 119 ministries. With all my thankfulness and appricciation of all you do and wishing you blessings and His Shalom! I concur with you, often times I wondered why the enemy seem to have a free highway into my life, though I am leading others in spiritual warfare successfully for themselves, their families and churches,until recently it hit me as a rock generational covenants are responsible for these hindrances. This does speak to me! I have lived in Ohio for over 40 years. I have had several dreams about going back to Oklahoma, to visit my mother’s relatives. I was also born in Oklahoma, but we left there when I was 2 years old and I’m 63 now. My mother even gave me her mother’s diamond wedding ring before my mother died a couple of years ago. It fits perfectly, I’m still wearing it! It looks like the Lord has arranged for me to go visit my dad’s side of the family in New Hampshire with my 88 year old Dad in September 2018. I have an uncle and many cousins there, one is ill with cancer. It also looks like the Lord has arranged for me to visit my mother’s sister in Oklahoma (she also has cancer) and my mother’s other sister is also coming, right after my trip to New Hampshire. I can’t believe the chances of this all happening in the same month! There are many of my mother’s extended relatives that live in Oklahoma, that I am friends with on Facebook, that I hope to finally meet! I briefly looked at your info on Freemasonry. I do not know if this has been in my family on either side. I have asked around a little, and no one seems to think there is any history of it. My dad’s side is Catholic and my mom’s side is Protestant. I know that Catholics were always told that since it was a secret society, they were not allowed to join the Freemasons. Anyways, I have renounced it from my family line just in case. But a couple of things caught my eye while printing your info about Freemasonry. Something about the “King of Tyre” has come to me previously when I was reading about Israel’s early history. And I have been drawn to wearing a “Tree of Life” necklace. I see you have something about the “Tree of the Knowledge of Good and Evil” in the handout on Freemasonry. So while I am not real strong in the prophetic yet, I do believe the Lord is leading me through some kind healing and deliverance in the generations on both sides of my family. I also went to New Hampshire with my dad last summer and I felt the Lord was doing a work at that time too. And as I listened to a recent webinar on the Courts of Heaven with Doug Addison on 8-18-18, I sobbed on and off for no reason. It felt like a deliverance, with something being squeezed out of me, like with contractions in my whole body! I don’t know whether or not my lineage an ancestors, near or far, engaged in this; I want to go through this and repent just in case. AS children, I and my peers and siblings did not learn much about our extended family’s traits and sins, on either maternal or paternal sides, so I am assuming it is a good thing to go ahead and repent and renounce, just in case. I really don’t know much about the sins of my ancestors in re to any demonic activities.. I do know as missionaries, my folks encountered much animistic / devil worship/sacrifice/ and islamic oppression…in the Ivory Coast, as career missionaries , starting in 1948…. so curses most likely were put on them. I know I have confessed meddling with stuff that of ouiga board when I was entering college; I have long since repented of that. And of anything I can think of that may be related, that I am not certain is linked, but just in case.. I am often and frequently releasing and forgiving the perpetrators in my life, those i encountered in the CMA boarding school for mks.. ( missionary kids); at age 55, i entered a hellish time that lasted mostly for 10 years-or 11…of multiple abuses… not only by staff at Mamou, but students, and my own parents.. I have cleansed the memoreis as much as is possible,, forgiven, repented of my anger.. repeatedly…and I ahve asked The Father to remove those memoires and their related pain.. I am WITH you in this struggle… This is a vital issue for me; The Courts of Heaven series has been enlightening and insight-full…..I need to make petitions for my own children too, and my grand kids.. Thank you for this article and your wonderful encouraging update! Viv (Palmer) Harvey…. Very enlightening study. Thank you, Wanda. I was wondering about the Catholic Church as well. Do we as former Catholics need to repent of Catholic abuses over the decades or even centuries? Or is it up to the clergy to repent? It depends on how much you personally were affected by this. These kinds of prayers are most effective (and needed) when the Lord has revealed some personal connection to you. If it’s an issue that is affecting your walk, trust that the Holy Spirit will reveal something specific to you. Otherwise, don’t worry about it.